Deptford became an important suburb of London in the 16th century, when it was one of England's main shipbuilding sites. The Royal Dockyard and the East India Company's yard were established here during Henry VIII's reign. 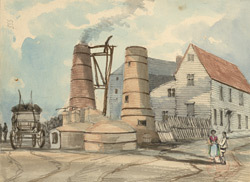 It was in the 19th century that Deptford became a huge industrial centre hosting chemical works, engineering works, gasworks, soap and candle factories, sawmills, coal and timber wharves, paintworks, breweries, food stores and verdigris works for the manufacture of copper sulphate.